Our life will turn into existence and will seem completely uninteresting if we will not have a dream or illusions... If adult people would believe in Santa Claus after 21, their sense of reality would be much brighter. For people who still believe in love, magic, or existence of gray-haired old man in heaven there are various gadgets of virtual reality which help to experience new emotions. How do you like the idea of getting a beatiful virtual girlfriend, who talks gently and kindly and feeds you with something sweet? An unusual prototype of virtual reality glasses was designed in Japan and introduced in March 2018. Puccho A-N 4D Goggles is designed primarily for the male audience, most likely for students, pop-idols fans. The main character of Puccho VR is a pop-singer Kanna Hashimoto from japanese all-girls band Rev. from DVL. The user of this device sees Kanna wearing uniform and walking around classroom. She is talk and offering the user a candy. 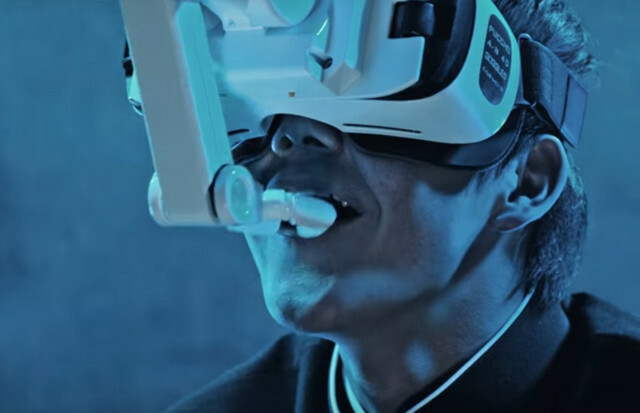 The mechanical arm fixed on the VR glasses synchronizes with the movements of the girl and at the right moment will feed the user with candy. The mechanical arm of VR Goggles Puccho. VR glasses Puccho can not be purchased at store and apparently it's exist only in a few copies. Two of them will be raffled among the subscribers of official Twitter account of Japanese candy manufacturer Puccho. Just follow and tweet about campaign with #pucchokun between March and May 2018. Most likely the goggles will not go to the series and designed to attract attention to the pretty but a little bit strange candy's advertising campaign.